Clinical sleep study proves that the Nightmare King increases the chance of having nightmares by 3.5 times. Can a burger give you nightmares? 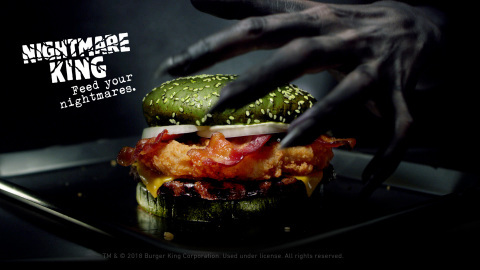 That’s what the Burger King® brand set out to prove with an unusual research study on its latest Halloween burger, the Nightmare King. This spooky sandwich features ¼ lb* of savory flame-grilled beef, a 100% white meat crispy chicken fillet, melted American cheese, thick cut bacon, creamy mayonnaise, and onions all assembled on a glazed green sesame seed bun. In partnership with the Paramount Trials and Florida Sleep & Neuro Diagnostic Services, Inc. and Goldforest Inc., the Burger King® brand conducted a scientific study over 10 nights with 100 participants (or should we say victims?) who ate the Nightmare King before they went to bed. By tracking various signals from the sleeping subjects including their heart rate, brain activity and breath, a group of doctors and scientists identified whether the individuals had vivid dreams. "Someone... transformed into the figure of a snake", reported one of the study’s subjects when asked about her dream. Another recalled “aliens attacking” the boat he was on. Some Burger King® sandwiches are the burgers of their dreams. The Nightmare King is the burger of their nightmares. If you’re brave enough, or just enjoy a good scare, visit your nearest participating Burger King® restaurant and try the haunting new sandwich. Happy Halloween. *Weight based on pre-cooked patties. Available for a limited time only at participating restaurants. **Offer subject to availability at participating locations. Offers cannot be combined. Postmates reserves the right to cancel the promo at any time. Postmates terms of service apply. Founded in 1954, the BURGER KING® brand is the second largest fast food hamburger chain in the world. The original HOME OF THE WHOPPER®, the BURGER KING® system operates more than 15,000 locations in approximately 100 countries and U.S. territories. Almost 100 percent of BURGER KING® restaurants are owned and operated by independent franchisees, many of them family-owned operations that have been in business for decades. The BURGER KING® brand is owned by Restaurant Brands International Inc. (TSX,NYSE:QSR), one of the world's largest quick service restaurant companies with more than $27 billion in system-wide sales and over 23,000 restaurants in more than 100 countries and U.S. territories. To learn more about the BURGER KING® brand, please visit the BURGER KING® brand website at www.bk.com or follow us on Facebook and Twitter.